An electric car that is currently on a 34,000 kilometre zero-emission road trip from the Netherlands to Australia, recently called into Dubai International (DXB) to refuel and show support for Dubai Airports’ green mobility event. 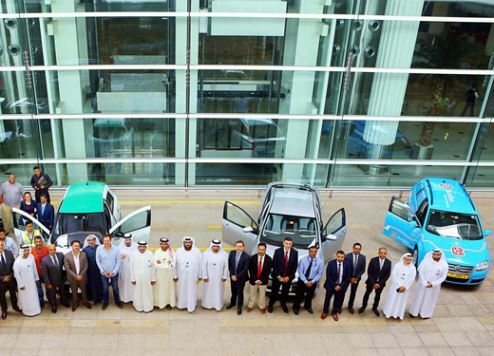 Dubai Airports organised the event to promote the adoption of clean energy and highlight the positive impact of electric and hybrid vehicles in achieving energy efficiency and reducing overall carbon emissions. Dutch campaigner Wiebe Wakker is driving his electric car from the Netherlands to Australia as part of his project Plug Me In to promote sustainable ideas and popularise electric vehicles. Wakker had already driven through 22 countries before arriving in Dubai for the event, which aimed to raise passenger awareness of the environmental benefits of cleaner technology. To pique their interest, three electric vehicles were on display at DXB. “Dubai Airports is committed to supporting Dubai’s vision to reduce [its] carbon footprint and adopt cleaner technologies for an environmentally sustainable future,” said Michael Ibbitson, executive vice president – technology & infrastructure at Dubai Airports. The overall Dubai target for the share of hybrid and EVs is at least 2 percent penetration rate by 2020 and 10 percent by 2030 of total vehicles registered in Dubai. This target is in line with international benchmarks and would result in estimated fuel savings of about 3 billion litres or 5 percent of total consumption by 2030.